Award-winning columnist and journalist Gillian Tett presents a thorough examination of how our tendency to create functional departments—silos—hinders our work … and how some people and organizations can break those silos down to unleash innovation. After finishing Fool’s Gold, her book on the financial crisis, Tett decided to explore in more detail the silo effect and its impact on all facets of our society. 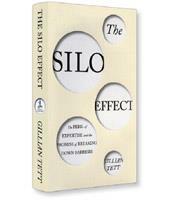 The result is a fascinating new book entitled The Silo Effect: The Peril of Expertise and the Promise of Breaking Down Barriers. If some of Tett’s terms, such as “mental and social ghettos” or “tribalism,” seem to be more the jargon of an anthropologist than a financial journalist, there is a reason: Before becoming a financial journalist, Tett trained as an anthropologist, earning her Ph.D. after spending months in a remote mountainous village in Soviet Tajikistan, studying a culture that maintained its ethnic, Muslim identity while embedded in a Soviet, atheistic society. Tett’s anthropological background is what makes The Silo Effect a unique and illuminating treatise on what can sometimes be seen as a maddening phenomenon. As Tett makes clear, the silo effect exists because that’s what people tend to do. Before launching into the case studies that form the heart of the book, she spends an entire chapter laying the anthropological foundation of silos, notably through the work of anthropologist Pierre Bourdieu, of “classification” — that is, humans’ tendency “to arrange space, people and ideas.” We create mental maps that become the cultural “habits” that govern our physical and social environment. Silos, Tett explains, are thus “cultural phenomena,” arising out of the systems we use to classify and organize the world. In the first half of the book, Tett details three cautionary stories of the damage that can be wrought by the silo effect, focusing on the once innovative Sony, left behind in the digital revolution; financial giant UBS, which was devastated more than any other bank by the subprime mortgage crisis; the world’s economists who failed to notice the global financial crisis fast approaching. However, just as Bourdieu argued that humans are not robots and can’t deprogram their mental maps, Tett insists that we can master silos rather than the other way around. The second half of the book tells positive stories of “silo-busters,” including Facebook, giant medical center Cleveland Clinic and hedge fund BlueMountain Capital. Perhaps the most engaging story in this second half is the journey of a thin, shy computer geek who joined the Chicago Police in the wake of 9/11 and would eventually be able to use his computer training to help the police break down its silos. From these stories, Tett draws the lessons of how to master silos: keeping the boundaries of teams “flexible and fluid,” with multiple opportunities for members of different teams to “collide and bond”; ensure that compensation plans discourage silos; ensure the open flow of information; encourage the questioning of the rules of the environment; and use technology to break down the silos. Insightful, engaging and practical, Tett may have written the definitive work on the silo phenomenon.